Bengaluru, Sep 05, 2017 : Describing “Mangaluru chalo” bike rally as ‘BJP’s divisive campaign’, Karnataka Chief Minister Siddaramaiah on September 05,Tuesday slammed the state BJP unit for “dividing people on communal lines” and urged it to instead work for the interests of farmers. “The Mangaluru chalo bike rally is BJP’s divisive campaign. Let us together do a Delhi Chalo to convince PMO to waive farmer’s loans,” the Chief Minister tweeted. 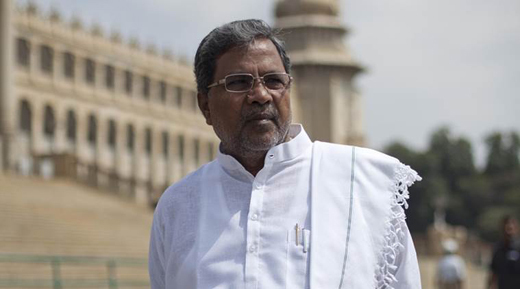 “Instead of disturbing public peace and dividing people on communal lines, BJP Karnataka should work for Kannada and Karnataka’s farmers,” Siddaramaiah added. His response came hours after several state BJP leaders were detained earlier in the day following their “Mangaluru chalo” bike rally organised in protest against the alleged killings of Hindu activists in the coastal districts. Former deputy chief minister R Ashoka, Lok Sabha member Pratap Simha and MLAs Arvinda Limbavali and Sitish Reddy were among those who were detained. A heated argument broke out between police and leaders after Ashoka and others protested near the Freedom Park, demanding that police furnish an arrest warrant. The protest brought traffic snarls around Freedom Park, which is situated near one of the busiest junctions in the heart of the city, causing inconvenience to daily commuters. Despite being denied permission by police for the rally, the BJP had insisted on proceeding with the rally plan. While the Mangaluru Police had denied permission citing reason of maintenance of peace in the communally sensitive coastal districts, the Bengaluru Police prohibited the rally in the city, citing law and order and traffic concerns. It is the corrupt politics which makes the peaceful situation worst. The Chief Minister of the state have to tackle the problem smoothly, but he is creating tensions by highlighting BJP and Congress,which is not right.